Ruthiebear (Titusville, NJ, United States) on 6 March 2013 in Landscape & Rural and Portfolio. 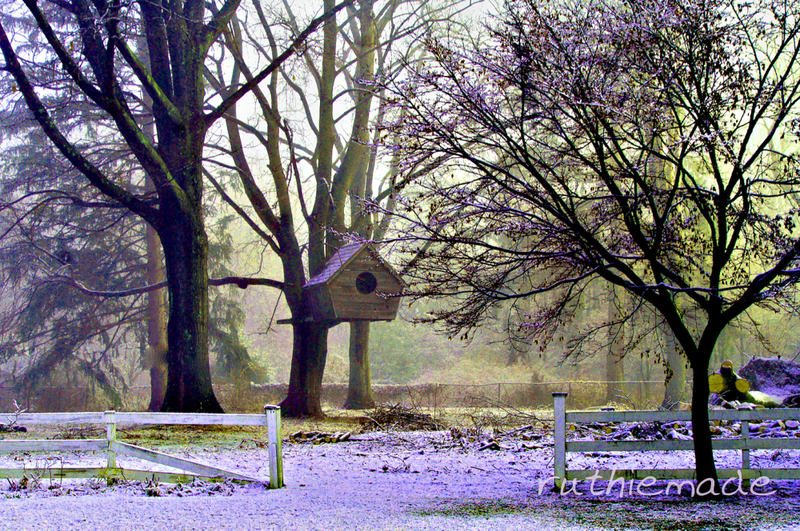 On February 8 I posted http://ruthiemade.aminus3.com/image/2013-02-08.html of my backyard in fall. Today here it is in a winter shot. The treehouse looks like a big birdhouse. My hubby built it for our kids when they were young. The birds will be flocking there. Very creative use of colour. Your backyard is nice place. Wonderful! And the treehouse is just great! Wonderful contrast with the autumn shot. That treehouse is a fascinating creation - good for Big Bird! I think the kids must have loved playing in the bird/treehouse. No doubt the next generation will enjoy it too. I love the composition and processing although in parts the shot is a bit blue !! Very moody, super processing and framing. Love the processing here Ruthie. A wonderful composition and beautiful winter scene. The tree house is very unique and the kids must have loved to play in it. Hope all is well with you. Wishing you a wonderful day ! Good job for the birds, great shot ! Ha - I thought it was a big birdhouse! I thought to myself, "Sheesh - how big do the birds get in New Jersey?!?" Really cool treehouse, and the surreal colors work here, Ruthie! Another beautiful view of the treehouse, both are awesome. The atmosphere is different, and it is very beautiful, great photo. Very beautiful composition colors and light ! Really a big birdhouse !! Lovely scene. The strange colors give a dreamy mood, well done ! This treehouse is stunning ! great picture as well as the first one. Beautiful picture ! I like the mood here . Une lumière jaune remplace le brouillard et la neige a pris la place des feuilles depuis le mois dernier. Interesting to see how trees bloom, then "winter" hits the trees. Great shot Ruthie ! A vey nice composition and lovely winter scené also a nice editing. Like a scene from a fairy tale. I like it. This image is like season trickery, I had to look for a while i just couldn't decide if it looked like a wintery scene or a scene with some cherry blossom everywhere :) a wonderful presentation Ruthie. And i DO like photography that makes me wonder. I like everything about this photo Ruthie, the purple-ish hue gives it a surreal feeling and the sunlight gives off such a pretty yellow glow.... a beautiful setting..... a great place for kids to grow especially with that gorgeous treehouse. I love it!! Joli nid douillet pour un oiseau! so beautiful colors & lights! Your husband is so creative! I love it! Beautiful image. I like the purple hue! Your kids, I hope, realize how blessed they are to have such a talented engineer/architect/builder for a Dad. What fun that must have been for them! And what a great winter season photo - I really like how you processed it. You have a splendid yard with beautiful trees. Nice shot with this fantastical purple tint. Nice to see both views, Ruthie. I love the surreal effect of coloring here. Amazing backyard and view ... a scene from a fairy tale! Beautiful image! Beautiful composition! Very attractive place! This is a great shot and I liked seeing it in the fall also. What a unique playhouse your hubby built. I'm guessing there was a ladder on the tree for them to get up there. Now it's ready for grandchildren! la linda casa, para protección de los pájaros. Excelentes tonos... ***** Un abrazo. Superbe ta photo!!!! quelle lumière!!!! bravo!! !